"Trans-Anatolian pipeline" redirects here. For the planned crude oil pipeline connecting the Black Sea with the Mediterranean, see Samsun–Ceyhan pipeline. "TANAP" redirects here. For the national park in Slovakia, see Tatra National Park, Slovakia. 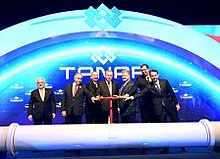 The Trans-Anatolian Natural Gas Pipeline (TANAP; Azerbaijani: Trans-Anadolu Təbii Qaz Boru Kəməri, Turkish: Trans-Anadolu Doğalgaz Boru Hattı) is a natural gas pipeline in Turkey. It is the central part of the Southern Gas Corridor, which will connect the giant Shah Deniz gas field in Azerbaijan to Europe through the South Caucasus Pipeline, TANAP and the Trans Adriatic Pipeline. The pipeline has a strategic importance for both Azerbaijan and Turkey. It allows the first Azerbaijani gas exports to Europe, beyond Turkey. It also strengthens the role of Turkey as a regional energy hub. The construction of the 1,841-kilometre (1,144 mi)-long pipeline started in March 2015, and it was inaugurated in June 2018. The project was announced on 17 November 2011 at the Third Black Sea Energy and Economic Forum in Istanbul. On 26 December 2011, Turkey and Azerbaijan signed a memorandum of understanding establishing a consortium to build and operate the pipeline. At first, a film dedicated to TANAP project was demonstrated. In the film, it was emphasized that TANAP is the signature of friendship and brotherhood between Turkey and Azerbaijan to Anatolia. In spring 2012, the process of conducting the technical-economic feasibility study was launched. On 26 June 2012, President of Azerbaijan Ilham Aliyev and then Prime Minister of Turkey Recep Tayyip Erdoğan signed a binding intergovernmental agreement on the pipeline. Also, the agreement was signed by Azerbaijani Industry and Energy Minister Natig Aliyev and Turkish Minister of Energy and Natural Resources Taner Yildiz. The initial agreement on organizational issues between BOTAŞ and SOCAR was signed by Natig Aliyev and Taner Yildiz, SOCAR President Rovnag Abdullayev and BOTAŞ Deputy Director General Mehmet Konuk. The host country agreement was signed by Yildiz and Abdullayev. On March 17, 2015, both Erdoğan and Aliyev met with Giorgi Margvelashvili, President of Georgia, in the city of Kars in Eastern Turkey to formally lay the foundations for the pipeline and marking the work as started. On 12 June 2018, the TANAP was inaugurated at the compressor-measuring station in Eskisehir. The ceremony was attended by the Turkish president Erdoğan, the Azerbaijani president Aliyev, the Ukrainian president Petro Poroshenko, the Serbian president Aleksandar Vučić, and the Bulgarian prime minister Boyko Borisov, as also by the head of SOCAR Abdullayev, Turkish minister of energy and natural resources Berat Albayrak, and the chief executive officer of BP Bob Dudley. The pipeline cost US$8.5 billion. $800 million of funding was approved by the International Bank for Reconstruction and Development. The capacity of the pipeline is 16 billion cubic metres (570 billion cubic feet) of natural gas per year at initial stage and would be increased later up to 23 billion cubic metres (810 billion cubic feet) by 2023, 31 billion cubic metres (1.1 trillion cubic feet) by 2026, and at the final stage 60 billion cubic metres (2.1 trillion cubic feet) to be able to transport additional gas supplies from Azerbaijan and, if the Trans-Caspian Gas Pipeline, from Turkmenistan. Its capacity would be increased by adding parallel loops and compressor stations according to the increase of available supplies. The pipeline will consist of 56-inch (1,400 mm) pipes until Eskişehir, and 48-inch (1,200 mm) pipes thereafter . The maximum height of the pipeline is 2,700 metres above mean sea level. The TANAP pipeline passes through 20 provinces of Turkey - Ardahan, Kars, Erzurum, Erzincan, Bayburt, Gümüşhane, Giresun , Sivas, Yozgat, Kırşehir , Kırıkkale, Ankara, Eskişehir, Bilecik, Kütahya, Bursa, Balikesir, Çanakkale, Tekirdağ and Edirne. The pipeline will start from Sangachal terminal and in territory of Azerbaijan it will be the expansion of existing South Caucasus Pipeline (SCPx). From end point of SCPx which is in Erzurum it will be continued to Eskishehir where it will unload 6bcm of gas entitled to Turkish buyers. From Turkey-Greece border it will continue through Greece, Albania and will end in Italy. The exact route of the pipeline is not clear. However, it was announced that one branch from Turkey would go to Greece and the other to Bulgaria. It would be connected with Trans Adriatic Pipeline. The Turkish government said in March 2015 that a branch from Greece through Macedonia and Serbia to Hungary was also under consideration. The TANAP is operated by SOCAR. SGC holds 58% stake in the project. Turkey's pipeline operator BOTAŞ own 30%, while BP acquired 12% in the project on March 13, 2015. The TANAP project company is headquartered in the Netherlands. Initially, Azerbaijan had held an 80% stake, with Turkey owning the remainder. The Turkish stake was divided between the Turkish upstream company TPAO (15%) and the Turkish pipeline operator BOTAŞ (5%). The international companies from the Shah Deniz consortium (BP, Statoil and Total) had an option to take up to 29% in TANAP. However, only BP exercised this option in December 2013. The Turkish government decided then that only BOTAŞ will hold a stake (20%) in TANAP. The Turkish pipeline operator acquired an additional 10% in May 2014. SOCAR's initial plan was to retain 51% and operatorship of the project. Several private Turkish companies had been interested in the remaining 7%, but this did not materialize. CEO of TANAP is Saltuk Düzyol, the former general manager of BOTAŞ. Rouge Pipeline and Process Services LLC - Based in Dubai, ROUGE Pipeline & Process Services is broadly divided into 3 divisions – Pipeline Services, Process Services and Talent Solutions. With its strategic alliances and representative offices in GCC countries (KSA, Oman, Kuwait), Algeria, Russia, Azerbaijan, Turkey and India, ROUGE is a market leader providing specialist services to both Onshore & Offshore companies in the Oil & Gas Industry. ^ a b "Turkey, Azerbaijan to start work on new mega gas pipeline". Hürriyet Daily News. 2015-03-17. Retrieved 2015-03-17. ^ a b c "Turkey opens TANAP pipeline that will bring Azeri gas to Europe". Deutsche Welle. 2018-06-12. Retrieved 2018-06-17. ^ Demirmen, Ferruh (2011-12-19). "BP-SOCAR duo deliver 'coup de grace' to Nabucco". News.az. Retrieved 2011-12-25. ^ "Azerbaycan'la tarihi anlaşma". Sabah (in Turkish). Retrieved 2018-02-21. ^ Socor, Vladimir (2012-04-04). "Interest Growing All-Round in Trans-Anatolia Pipeline Project". Eurasia Daily Monitor. 9 (70). Jamestown Foundation. Retrieved 2012-05-24. ^ "Turkey, Azerbaijan sign gas pipeline deal". Bloomberg Businessweek. Associated Press. 2012-06-26. Retrieved 2012-06-28. ^ a b c Socor, Vladimir (2012-06-27). "Aliyev, Erdogan Sign Inter-Governmental Agreement on Trans-Anatolia Gas Pipeline to Europe". Eurasia Daily Monitor. 9 (122). Jamestown Foundation. Retrieved 2012-06-29. ^ "Turkic Council News Bulletin 15 June – 15 July 2012" (PDF). Turkic Council Secretariat. Retrieved 2018-06-17. ^ Abbasov, Kamran (October 2015). "Role of energy in Azerbaijan's foreign policy during Ilham Aliyev era" (PDF). Middle East Technical University. Retrieved 2018-06-17. ^ "Ukraine hopes to receive gas via TANAP in future – Poroshenko". Interfax-Ukraine. 2018-06-12. Retrieved 2018-06-12. ^ "TANAP gas pipeline connected with TAP at Turkish-Greek border". AzerNews.az. 2018-11-21. Retrieved 2018-11-26. ^ "TANAP, TAP p/lines interconnect at Turkey-Greece border". Retrieved 2018-11-26. ^ "$2.5 billion in external finance secured for TANAP". Daily Sabah. Retrieved 2017-10-04. ^ Blank, Stephen (2012-05-04). "Russia Again Seeks to Quash the Trans-Caspian Pipeline". Eurasia Daily Monitor. 9 (85). Jamestown Foundation. Retrieved 2012-05-24. ^ a b Socor, Vladimir (2012-09-11). "Azerbaijan Drives the Planning on Trans-Anatolia Gas Pipeline Project". Eurasia Daily Monitor. 9 (164). Jamestown Foundation. Retrieved 2012-09-12. ^ a b "TANAP Informatıon Note" (PDF). Retrieved 14 August 2018. ^ JIS. "Trans Anatolian Natural Gas Pipeline (TANAP) | Socar Midstream". www.socarmidstream.az. Retrieved 2018-02-22. ^ "SOCAR "pegged" 80% for itself in Trans–Anatolian gas pipeline". ABC.az. 2011-12-27. Archived from the original on 2012-12-05. Retrieved 2011-12-27. ^ Agayev, Zulfugar (2011-12-23). "Pipeline to Ship Azeri Gas to Central Europe, Balkans, WSJ Says". Bloomberg. Retrieved 2011-12-25. ^ "One sure winner emerges in southern gas corridor race". Euractiv. 2013-03-08. Retrieved 2013-03-08. ^ "BP becomes a partner in the Trans-Anatolian gas pipeline". Daily Sabah. 2015-03-13. Retrieved 2015-03-17. ^ "BP acquires 12 percent stake in TANAP pipeline project". Hürriyet Daily News. 2015-03-13. Retrieved 2015-03-17. ^ "RESULT OF TENDER FOR TANAP PROJECT'S SCADA/TELECOMMUNICATIONS SYSTEM ENGINEERING, PROCUREMENT AND CONSTRUCTION (EPC) WORKS ANNOUNCED | TANAP". www.tanap.com. Retrieved 2018-02-22. ^ "TANAP - Trans Anadolu Doğal Gaz Boru Hattı, Lot 2". www.yuksel.net. Retrieved 2018-02-22. Wikimedia Commons has media related to Trans-Anatolian Natural Gas Pipeline. This page was last edited on 26 November 2018, at 17:14 (UTC).